The radar beam from the satellite scans the ocean surface, detecting variations in relief of up to 80 metres in places. Ocean relief, which is stable, is shaped by the geoid—the surface normal to the direction of the Earth’s gravity field. At smaller scales, but still included within the geoid, hills and valleys on the sea surface of the order of one metre reflect peaks and trenches as high and as deep as one kilometre on the seafloor. In addition to the geoid’s impact on sea level, the major ocean currents such as the Gulf Stream, Kuroshio and Antarctic Circumpolar Current generate variations in ocean relief of about one metre. 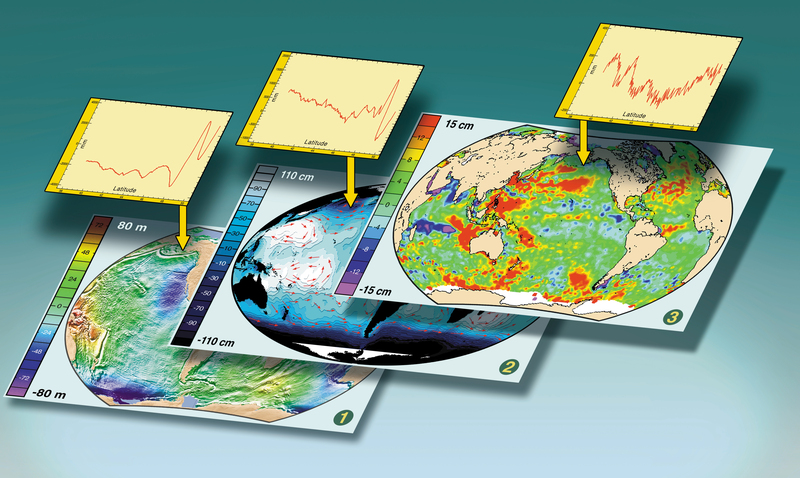 The geoid and the major ocean currents form what is termed the mean sea surface (MSS), which varies very little. But sea level around the globe is far from constant, exhibiting anomalies of about ten centimetres with respect to the MSS that we can detect from altimetry measurements. 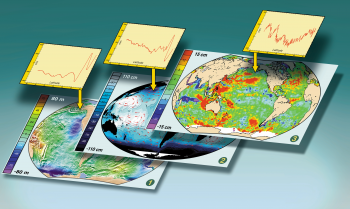 These sea level anomalies (SLAs), driven by eddies, seasons or phenomena such as El Niño spanning several years, are the main focus of attention for physical oceanographers today.